This summer SparkFun was proud to support camps across the nation dedicated to inspiring a love of making! Here are just a few of our favorites. This summer, Denver Public Library shook up the traditional model of a summer reading program where readers mark down how many books or how many hours they’ve read and bring their tally to the library for a rubber duck or tickets to an amusement park. 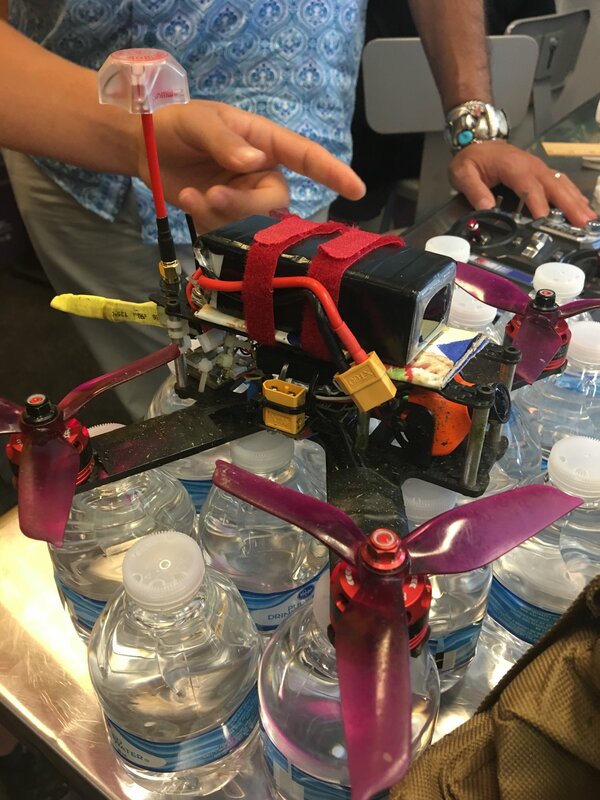 The library rolled out “The Maker Challenge” into this year’s Summer of Adventure program, allowing children to document their learning by making something and uploading it to the DPL website. Everyone who did so was entered into a drawing for tools, art supplies, and electronics kits donated by SparkFun that would help them keep making. DPL’s 26 branches received a total of 448 submissions, 10 percent from preschoolers and younger, 60 percent from students in grades K–5, and 30 percent from middle and high school students. To help celebrate the end of summer, and give participants a chance to show off their work, the library held a Maker Showcase at the SM Energy ideaLAB on August 20. More than 50 young people and their families came to show off what they'd submitted to The Maker Challenge, pick up prizes and meet other young makers from across the Denver metro area. The Refuge in Sunbury, Pennsylvania, is a nonprofit youth center serving students in grades 6 through 12. For the past five years the organization has been engaging students in hands-on STEM-related activities. One of the students’ favorite activities is electronics involving soldering. This summer SparkFun donated Roshamglo Badge Kits, first introduced at South by Southwest® (SXSW) 2017, to help The Refuge teach basic soldering skills in a fun way. Students soldered six battery clips to the underside of the Roshamglo board, which uses the ATtiny84 and has an IR LED and receiver to communicate between badges. Once they inserted batteries, they were able to play Rock-Paper-Scissors with each other simply by pointing the USB connector at their opponent’s Roshamglo up to 5 feet away and pressing the 5-way switch to the left for rock, up for paper, and right for scissors. The red/green LED displays a solid red for lose, green for win, or alternate red and green for a tie. Snyder added that students were so excited they asked to make two badges so they could take one to play against friends who couldn’t make it to build day. The Allen County Tech Wizards program provides 20 at-risk youths in grades 3 through 5 with opportunities to discover and learn about STEM activities and careers. 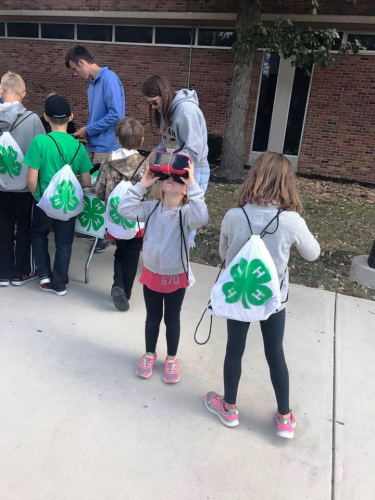 Each student is matched with a mentor for the duration of the two-year program, which is funded through the National 4-H Mentoring Program and the Department of Justice. Students meet for an hour after school once a week and then twice during the summer. 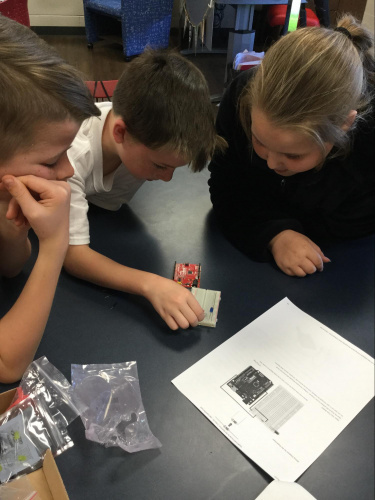 This summer the Tech Wizards took on circuit building with donated SparkFun Tinker Kits. The students were allowed to investigate their kits and try to identify the parts without any instruction. Even with no prior electronics experience, the students did an excellent job identifying the objects and tried to guess what they would be used for and how they fit into the circuits. They were then given diagrams to help them set up the various circuits in the kit. After completing the circuits they experimented with and talked about what might happen if things were connected differently or not at all. In collaboration with surrounding counties, the Allen County OSU hosted a STEAM (Science, Technology, Engineering, Art, Math) event on Sept. 30 at the university regional campus. More than 400 youths attended, and circuitry was among the activities! SparkFun donated a Bare Conductive Touch Board and Bare Conductive Electric Paint to another OSU Extension 4-H camp this summer. See the interactive mural campers there created!